What Makes DaCast’s Direct HLS Low Latency Streaming Solution an Industry First? Get access to a complete and affordable low latency live broadcasting solution. With DaCast this — and more!— is now possible. DaCast is now offering a direct HLS fully integrated streaming solution for live low latency streaming on all devices for all live events sizes. Thanks to the HLS stream ingest, you can offer your viewers lower latency streaming, while maintaining full all-device compatibility. Our direct HLS low latency streaming solution is also based on a free, lightweight software encoder. This makes DaCast’s direct HLS streaming solution an industry first. In fact, low latency streaming with DaCast will revolutionize your live streaming workflow. Let’s see why, below. DaCast is the first online video platform to offer both a free HLS software encoder and an easy-to-use, scalable and affordable live streaming solution. No other online video platform on the market can match this combination. We are very proud to be the first online video platform to offer a FREE low latency HLS live stream encoding software. With this offering, we’re making affordable, high-performing, low latency streaming available for all broadcasters. This free application provides exceptional low latency streaming functionality to our users! The same software is only available elsewhere at prices starting at around $1,000 and more. The new DaCast HLS encoder is based on OBS Studio, an open-source live streaming encoder. And that means it includes all the great mixing and production tools that OBS offers, plus support for all the plugins and extensions that make OBS Studio so powerful. Finally, our HLS encoder is also backwards-compatible with RTMP. Our new HLS encoding software is powerful AND lightweight. It’s compatible with both Mac and Windows, and requires only a small amount of CPU processing power and memory. In fact, it can run on a consumer-grade laptop without issue. Only 8 GB of RAM and an i5 (or better) CPU is required. This marks a MAJOR improvement over encoders that require high-powered workstation computers, and over hardware encoders as well. In short, DaCast is the first video platform to give all businesses the ability to use low latency streaming easily and affordably. Does this new HLS encoder mean more complicated configuration? No. In fact, it will make setting up a live stream easier than ever before. 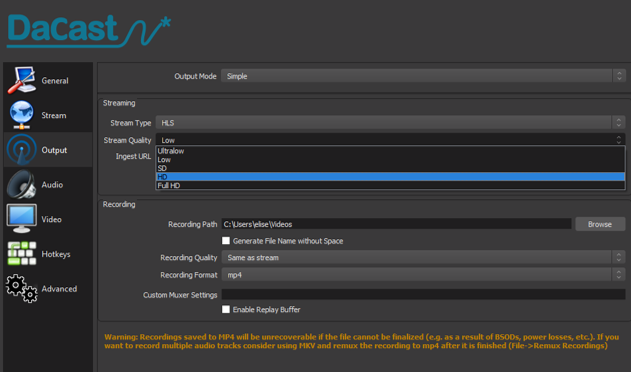 Our customized HLS version of OBS Studio pre-defines many of the important settings. We’ve designed it to offer our broadcasters a smooth, streamlined experience. For example, all video quality settings have been pre-defined. We’ve included common quality presets that set CBR, keyframe interval, resolution, audio bitrate, and more. These pre-set features allow you to simply choose your quality level, and start low latency streaming right away. STEP 1: Download the new free DaCast OBS Studio directly in your DaCast account. You can find the link in the publishing settings for any live channel. 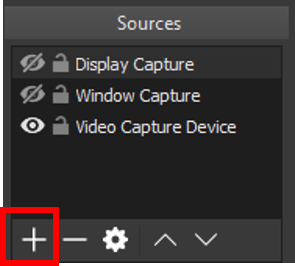 STEP 2: Open DaCast OBS Studio, and then add your video sources using the + button in the sources widget. STEP 3: Click on settings, and then select the “Output” tab. Under Output Mode, select “Simple.” For Stream Type, select HLS. For Stream Quality, select one of the pre-defined profiles: Ultra low definition, low, standard, HD or Full HD. STEP 4: In the “Ingest URL” field, enter the direct HLS URL provided by your account executive. STEP 5: Click OK, and you are now ready to stream live. Click the “Start Streaming” button to go live. More details can be found on our support page for HLS Direct. Will I need to purchase new equipment for low latency streaming? No! In fact, all you need to run your new encoder is a computer and your video source. No hardware encoder is required. And there is no extra cost, as our HLS software encoder is free to use! Why is HLS ingest live streaming the best solution? 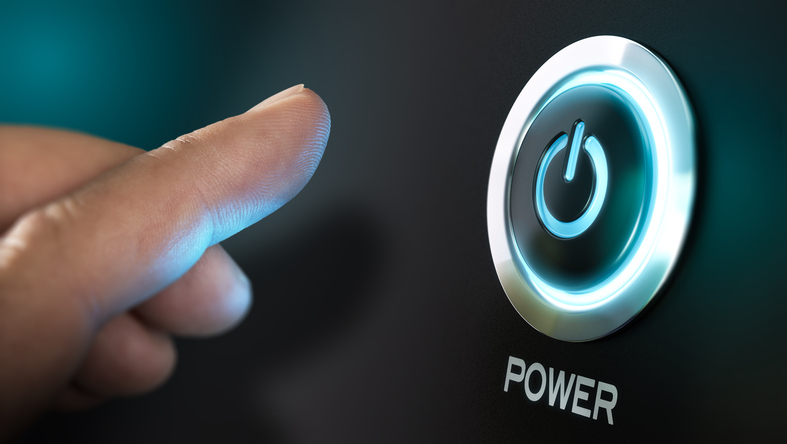 There are many different reasons why HLS ingest streaming is a better alternative than traditional RTMP ingest live steaming. In the RTMP vs. HLS debate, HLS is emerging as the clear winner. First, HLS Direct is an “end-to-end” low latency live streaming solution. End-to-end HLS streaming guarantees viewers much lower latency, while maintaining compatibility with all devices. HTTP Live Streaming, commonly called HLS, was introduced with the first iPhone over a decade ago. Today, most HLS streaming begins with an RTMP live stream, which is then converted to HLS in the cloud. HLS streaming lowers latency to ten second or less. All modern browsers and mobile devices now use HLS, which is the most secure and high-performance industry standard. HLS streaming also informs ongoing efforts to unify streaming standards under the Common Media Application Format (CMAF). CMAF is a new standard for video streaming that aims to simplify the world of protocols and standards. How can I get started with HLS ingest? It’s easy to get started with HLS ingest right away. This feature is now available to all DaCast users for testing. However, note that once it graduates from demo status, it will be available for Premium plan users and above. I’m a DaCast user, how do I sign up? If you are a DaCast user, call us our contact our 24/7 support team. We can set you up with HLS direct low latency streaming in a few hours. If you’re not already a DaCast user, sign up today and we’ll give you access to this feature. Just click the button below to sign up for our 30-day free trial (no credit card required). 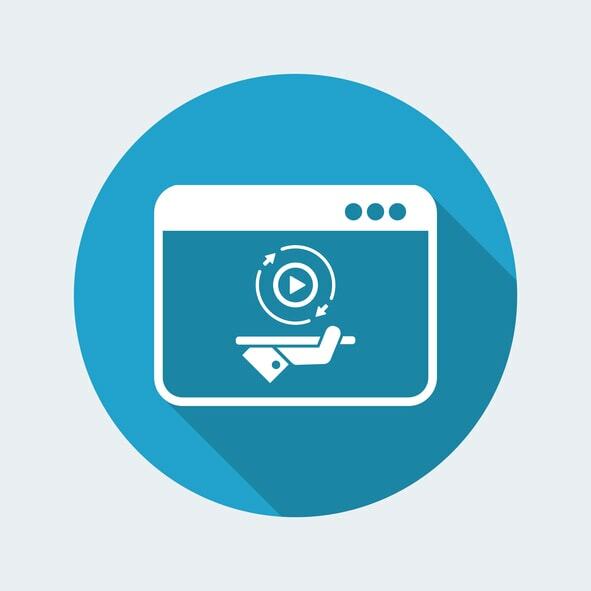 That gets you access to a full-featured video hosting and live streaming platform, with all streams delivered via the Akamai CDN—the largest and fastest on the planet. Plus, you’re guaranteed a slew of other features, including video monetization, security, embedding, social sharing, and more. For regular tips and exclusive offers, you’re also invited to join our LinkedIn group. Still have questions or feedback? Let us know in the comment section below, and we’ll get back to you. Thanks for reading! 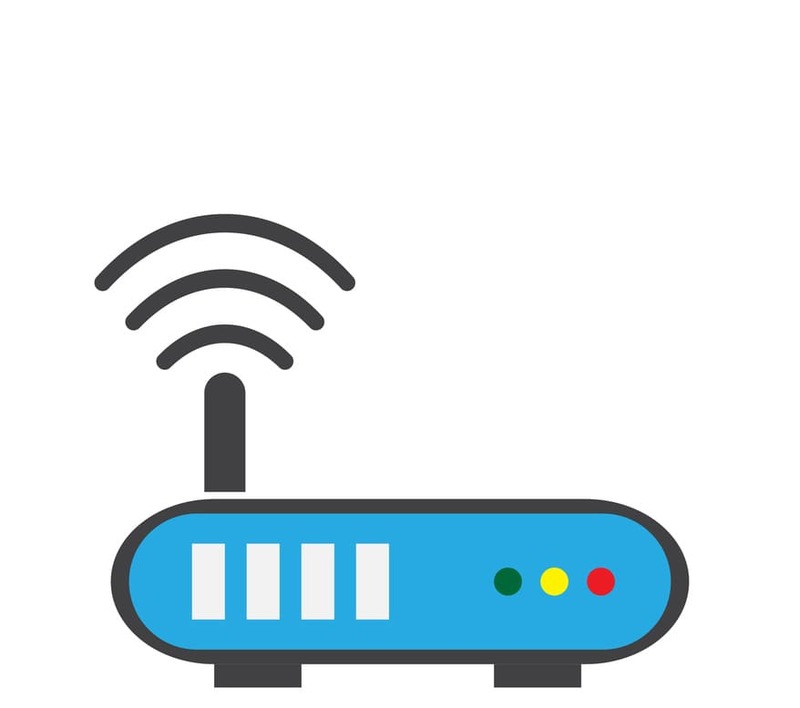 We hope you’re as excited as we are to test our low latency streaming solutions for yourself. Happy broadcasting!